Errol W. McKinson is a resilient and vibrant artist. He was born in the glowing capital of Kingston, Jamaica. At an early age, Errol was fascinated by the works of art that surrounded him. His first experience with color was from a set of watercolor paints given to him as a gift by his father, Edgar McKinson. Throughout his high school years, Errol became extremely interested in Impressionism. 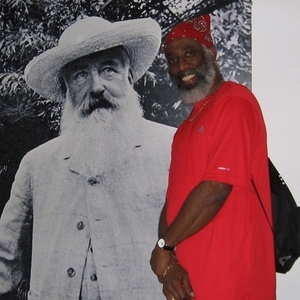 Upon reading a book from the school’s library at Wolmers High School for Boys, he was introduced to the techniques of Claude Monet, Pierre Auguste Renoir, and Edouard Manet. These Masters influenced his work today. As a “plein aír” painter and a practitioner of Impressionism and the Henry Hensche movement of Light and Color, Errol specializes in oils, acrylics, and watercolors. These media bring to life the warm majesty of his experiences from “back home” in Jamaica and incorporate awe-inspiring visions of the beauty that surround him in America, Europe, and France. Errol’s art studio is in suburban Maryland and his gallery can be found at http://www.mckinsongallery.com/ , Facebook at https://www.facebook.com/errolmckinsongallery and on Pinterest at http://www.pinterest.com/errolwmckinson/.